Westerpark is one of Amsterdam’s most colourful areas, with some of the most affordable homes in the city. Half the residents are not native Dutch, lending the district an international air. Westerpark’s youthful population can also get a little loud and disruptive. However, the crime rate is not high. The city centre is only a short bus, tram or bicycle ride away. In the Culture Park Westergasfabriek, you can find tree-filled parks and meadows as well as office spaces, restaurants, bars, and a cinema. The park serves as a venue for numerous cultural events including pop and classical concerts, fashion shows, festivals, and theatrical performances. Westerpark has four neighbourhoods. Zeeheldenbuurt is the oldest section. In the 17th, 18th and 19th centuries shipyards and mills employed hundreds of people here. In recent decades the area has become increasingly residential, but many old buildings remain. Many buildings dating from the early 1900s were designed in the Amsterdam School style. 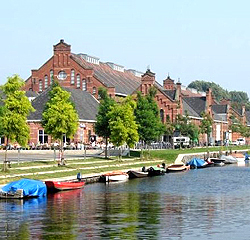 Spaarndammerbuurt in the west is supported by the shipping and timber industries. Staatsliedenbuurt was established as a home for professionals such as doctors, lawyers, civil servants, policemen and firemen. The Frederik Hendrik/Hugo de Groot area also used to have dozens of mills, though few remain today.